We offer a fully automated bulk data upload solution via your API control panel. 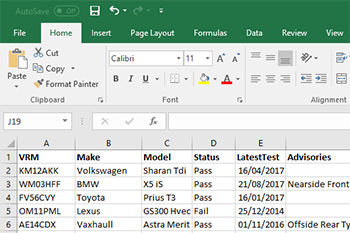 Simply upload your .csv in a pre-prepared format with the column titles you want returned. Wait for the return, or if it's too large, we'll email you when it's ready. The control panel bulk is suitable for our pre-formatted templates return up to 100,000 row or 5MB .CSV. To access this service simply log into your control panel and visit Products & Services > Bulk Upload ( https://panel.ukvehicledata.co.uk/BulkUpload) and there is no additional charge for this service. For jobs over 100,000 rows, monthly automation or complex returns we offer an SFTP upload service. Templates returns are agreed in advance with your account manager and the process is manually monitored. There is also no additional charge for this service and prices start from 1pence per VRM or VIN. We can take your incoming data in any format and return it back in a pre-agreed format to suit your needs. We are able to handle up to 1m records per day in our bulk system depending of the complexity of your return.